When new Livingston striker Jordyn Sheerin dropped down to play amateur football with his mates only three years ago, he thought football was only going to be a hobby for the rest of his life. Now Sheerin can call himself a professional footballer after the 25-year-old earned his first full-time contract, a remarkable feat given how far he’s come from the days when he contemplated giving the game up altogether. Sheerin penned a two-year deal at the Energy Assets Arena last week to become Mark Burchill’s first new signing of the summer transfer window after an embargo forced on the club by the SFA in their investigation into dual ownership was lifted following Gordon Ford taking on majority shareholder status at the club. After a six-week period out of the game when he left East Stirling in 2012, Sheerin was looking ahead to continue to work as a joiner alongside his dad as part of their attic conversion company – a career which he thought would take him to the end of working days. He was disillusioned after part-time spells at Arbroath and East Fife and resigned to the fact that his dream of making it as a professional footballer was over. It took countless phone calls from close friend and Rangers defender Lee Wallace, who started coaching at local amateur club Heriot Vale to persuade Sheerin to get back playing again. 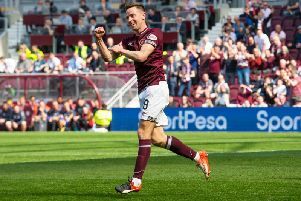 The ex-Hearts man showed incredible belief in Sheerin to convince him that he could still make something out of the game and thanks to Wallace, the two could line up against each other in the forthcoming Championship season. “Lee took me there [Heriot Vale] when I’d given up all hopes and ambitions of playing football,” said Sheerin. “Lee would phone me every day and say, ‘Listen, this isn’t happening, you’re going to do something with yourself at whatever level’. He was always right behind me pushing me and it took me a wee while to turn round and say, ‘Right, OK, I’ll come and play again’. He obviously saw something in me and I owe him a lot. Sheerin’s form for Vale earned him a call-up to the Lothian and Edinburgh Amateur FA (LEAFA) select side, where his goalscoring prowess, including five goals within a 13-minute period after coming off the bench at half-time in an inter-association fixture, got him a call-up to the Scotland amateur team. His performances at the cream of amateur level caught the eye of Musselburgh Athletic manager David McGlynn, who offered Sheerin the chance to join the Olivebank club and he replicated his nous in front of goal with a record 42 goals as Burgh reached the Scottish Junior Cup final. Although admitting the step up to Scotland’s second tier will be massive, Sheerin has no doubts that he’ll be able to cut it in the Championship against the likes of Rangers and Hibs, but first he has set himself a goal of getting rid of his belly before the new season. Livingston begin pre-season today and Sheerin, who has dropped two stone in weight since making the move to the juniors, is aiming to get lean ahead of the new campaign. He’s recently taken up hot yoga with Musselburgh keeper Ali Adams to shed the pounds. The title of being a professional footballer still hasn’t quite hit him yet and he’s not sure if it ever will. He spent time in the gym at the Energy Assests Arena last week with Scott Pittman, who made the move to Livi from Bo’ness United in January and hounded the midfielder with questions about the step up. He said: “It hasn’t really sunk in yet; I’ve been asking Pittman so many questions about how long it takes until you really realise and he must be getting bored of it. “I was watching Hibs a few seasons back when I was playing amateur and watching it, I felt devastated that I wasn’t playing professional football and thinking to myself I am a player, I’m just not living to my full potential. To be here now, thinking that I could be playing in front of those crowds next season, is just amazing.